The base of most traditional mortars and plaster mixes. 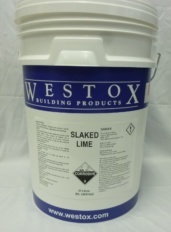 Westox Lime is slaked for 14 days prior to sale. Slaked Lime (unsieved) – used for Bricklaying, Rendering & Repointing. Run Lime (sieved 40mm mesh) – used for Running Cornices In Situ, Plaster Set Finish, Tuckpointing. Available in 20Lt, refer to individual sheets.